Image: The Doomsday Clock, which is now as close to midnight as it has been since the height of the Cold War. Credit: Olivier Douliery/ABACAPRESS/PA Images, all rights reserved. 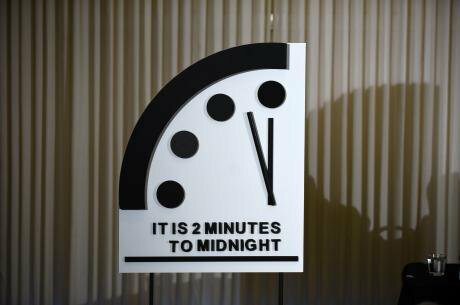 It is the "new abnormal", says the Bulletin of Atomic Scientists, announcing that the Doomsday Clock for 2019 will stay at two minutes to midnight. World leaders have not only failed to deal adequately with nuclear and climate threats but they have allowed them to increase, while their citizens are lulled into "a dangerous sense of anomie and political paralysis". CNN puts it bluntly: "It's almost the end of the world as we know it". Meanwhile at Davos, the World Economic Forum has been warned (if it was listening) about the new abnormal in global inequality and poverty and worsening human rights as well as climate change. Are we sleepwalking into another world disaster, this time perhaps terminal, and do we have the imagination and energy with which to confront it? Three times in the last century the world has had to deal with the consequences of catastrophe, and lessons should be learnt from how far it succeeded or failed. A hundred years ago, for ten evenings in February 1919, international politicians met in Paris to draft the Covenant of the League of Nations. During the day they worked on what would become the Treaty of Versailles; after dinner they moved to an ornate salon in the Hotel Crillon and sat till midnight in evening dress poring over rival drafts of the Covenant. President Woodrow Wilson presided, sitting in front of a huge gilded mirror -- it was his enthusiasm which propelled the discussions forward -- and he was flanked by the somewhat less enthusiastic British and French delegates. On February 14th he announced success with an agreed text of the Covenant: "A living thing is born...", he declared, 'it is a definite guarantee of peace". The promise was not fulfilled, as we know only too well -- although the League achieved more than it is usually credited for. Yet its creation did represent a great step forward in the long struggle to reduce the threat of war in an imperfect world, after half a century and more of efforts by peace societies and advocates, building on a much longer history of peace thinking and argument extending back to the great philosopher Desiderius Erasmus (1466- 1536) and his fellow-humanists. For the first time an international body was brought into being with the explicit aim of establishing and maintaining new norms for the peaceful conduct of international relations, linked through its special agencies to the promotion of economic and social welfare -- what we now refer to as 'positive peace". A second world war shattered these hopes, yet as the historian Sylvester Hemleben observed in 1942, "it would seem that every great war in history was followed by renewed interest in peace and by the presentation of plans to achieve it", and so it proved. Serious discussion on a successor to the League of Nations began early on during the war and the United Nations emerged in 1945 as a more effective organisation with a wider global reach. Its "failures" too are often touted though they are mainly caused by a lack of commitment by its member states, especially those on the Security Council, rather than by the organisation itself. As the UN's great advocate Erskine Childers (grand-son of the Irish nationalist) would write, the UN system "has accomplished vastly more than most of its citizens have ever been told about." Full justice should be given to the UN's achievements (as well as its failures) in peace-keeping and in providing a forum for conflict negotiation and resolution, its defence of human rights, its disaster relief and programmes of economic aid, its work to promote health and protect children across the world, To adapt Voltaire, if the UN did not exist we would have to invent it. This story of how two devastating world wars each inspired a new effort to build international institutions which might avert another disaster is well known. Less appreciated is the third occasion when the world emerged from a very dark period -- this time after a cold rather than a hot war -- and looked forward to a brighter future. The cold war was devastating in different ways: fewer millions were killed as a direct consequence (although some millions did die in Vietnam and other misleadingly called "local wars") but the damage to the international fabric of cooperation was as severe, and, as in 1919 and 1945, the ending of this war left the world in desperate need of a new initiative. Climate change and nuclear proliferation now lengthened the list of global threats to be addressed. Historians will look back on the promises made then to heal the world's wounds, and the failure to deliver on them, as a significant turning point -- in the wrong direction. It is a failure for which we are now paying the price, at a time when we are faced with a perfect storm on many fronts. In these past months a conviction has grown, among nations large and small, that an opportunity has been regained to achieve the great objectives of the Charter - a United Nations capable of maintaining international peace and security, of securing justice and human rights and of promoting, in the words of the Charter, "social progress and better standards of life in larger freedom". This opportunity must not be squandered. The Organization must never again be crippled as it was in the era that has now passed. There was wide acceptance, at least in theory, of the need to link peace to development, and of the "peace dividend" which could be obtained by the ending of the superpowers' arms race. In the 1994 issue of its path-breaking Human Development Report, the UN Development Programme urged a "peace dividend for human development" and the transition from "nuclear security to human security". The threat of climate change, and of the disproportionate effect it would have on the world's poorer people, was already well recognised. In its first report in 1990 the Intergovernmental Panel on Climate Change concluded that "emissions resulting from human activities are substantially increasing the atmospheric concentrations of the greenhouse gases" and that these would result in "an additional warming of the Earth's surface". We should note that, as far back as 1949, the first international conference on the environment had been held under UN auspices and had recognised the need to conserve the world's natural resources. The post-cold war optimism soon waned across many fronts. At first there was an overall decline in the international arms trade but this soon picked up again, stimulated by growing economic power in East Asia and continuing rivalries in the Middle East. Already in 1995, the World Social Summit could only call timidly for a reduction of "excessive" military spending subject to "national security requirements". On the nuclear front, the 1970 Nuclear Non-Proliferation Treaty was renewed indefinitely in 1995, but the main nuclear powers continued to fail to deliver on the pledge -- an essential part of the original bargain between nuclear and non-nuclear states -- to "pursue nuclear disarmament aimed at the ultimate elimination of their nuclear arsenals". Global poverty was reduced but very unevenly, with the statistics disproportionately improved in East and South Asia. A more ominous figure was the ILO's report on youth unemployment in 2003 showing 14.4 per cent in the Middle East and 25.6 per cent in North Africa (these are now even higher). On climate change, the strength of continued denial that there was a problem at all, and the failure to deliver results to halt global warming, hardly needs to be spelled out. Where are we now? A sober starting-point is the Agenda for Disarmament put forward in May last year by UN Secretary General Antonio Guterres (and largely ignored), warning that nuclear weapons pose an "existential threat" to humanity, with the world only one mechanical, electronic or human error away from a catastrophe. "Cold war tensions have returned, but in a much more complex and dangerous environment. ... .... Many of the disarmament commitments and promises entered into at the end of the cold war have gone unfulfilled". He urged that world leaders urgently need to return to "a common vision leading towards nuclear disarmament." Guterres is a generally cautious Secretary-General and his voice is stronger for it. A body of opinion now concurs with the 2014 Chatham House report (Too Close for Comfort) that the risks of nuclear disaster by accident or design are much higher than previously thought. And the investigative journalist Eric Schlosser ended his much-praised study (Command and Control) of nuclear near-misses during the cold war with the warning that the continued presence of nuclear arsenals is a barely suppressed "collective death wish". It is not only extreme poverty that disproportionately affects children, but poverty more widely. The World Bank Group also looks at higher poverty lines - such as those living under $3.10 a day, which includes people living in moderate and extreme poverty. When all those living on less than $3.10 are examined, children remain far worse off. About 45 per cent of children are living in households subsisting on less than $3.10 a day per person, compared with nearly 27 per cent of adults. Are we now in a new situation of post-war crisis, comparable to those of the past, demanding urgent action? Yes, we are in crisis but it is not "post-" anything because its multiple causes show no signs of coming to an end. The continuing nuclear threat, the persistence of poverty and inequality, the dominance of finance capital, the harsh effects of globalisation, and an exponential rise in global warming (indeed, we might say that the world is now "at war" with nature) are all inescapable facts, and they combine to present a potent mix, a perfect storm, which in combination are more dangerous to our future existence than if they had come separately in time. Just as individually we find it hard to contemplate our own death, so it is human nature to avert our thoughts from the prospect of mortality on a much larger scale. There is still a remnant of that 20th century optimism (growing in turn out of 19th century determinism) sustaining the belief that somehow single answers will be found to deal with threats singly. This is to under-estimate the multiplier effect of a fearful cocktail of dangers: concerted threat requires a concerted response. There are separate campaigns against nuclear weapons, to combat world poverty and inequality, to arrest -- or at least slow down -- global warming, to defend human rights against authoritarian regimes and rulers, and (this last the smallest in scale) to support and strengthen the United Nations. We need to admit that despite all their efforts, none are going to succeed unless they can combine to make a more effective force for peace in its fullest sense, opposing jointly the full range of destructive forces which threaten us today. This time, unlike in 1919 or 1945, we do not need a new world organisation, but we do need a new world campaign.